The message from Oregon's Office of Public Defense Services is stark: Revamp the public defense system or watch services dwindle. Either way, the state agency refuses to let Oregon continue to be the only state in the nation that relies entirely on outside attorneys for trial services. That path was set in motion in February when the commission overseeing the agency voted unanimously to move from the contracting model to one where the bulk of attorneys are state employees. Eric Deitrick, general counsel for Public Defense Services, said that reform would allow for better legal defense for low-income Oregonians and for more oversight of the system. Deitrick said that transition will happen even if the Legislature provides only the current level of funding. Without additional funding, the agency is likely to scale back the overall service it can provide, Deitrick said. 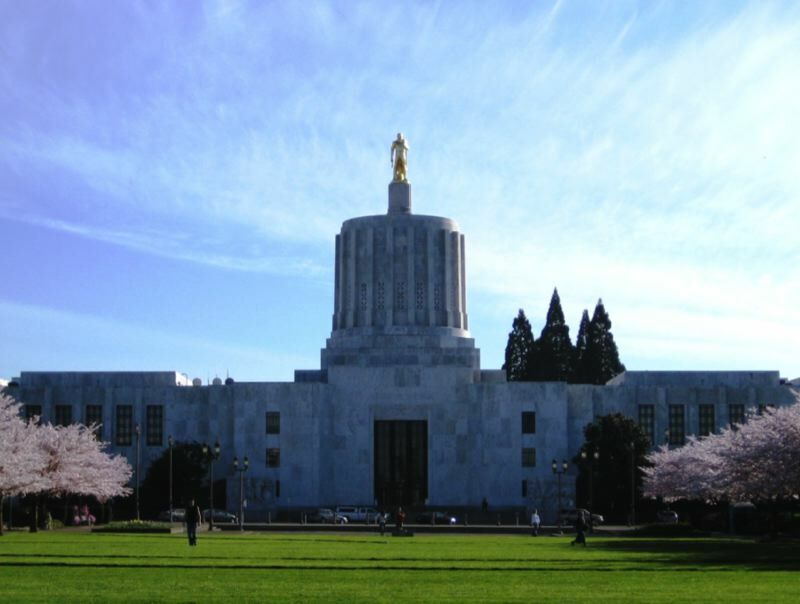 To provide indigent defense services, Oregon contracts with public defender offices throughout the state. The attorneys are not state employees so the state has little oversight of their caseloads and proficiency. "We can provide better quality assurance and supervision in a state system because many would be state employees, and so naturally, supervision and mentorship would be available, whereas now we work with 100 percent independent contractors," Deitrick said. The issues with Oregon's public defense system are not secret. Public defenders have long been vocal about the issue of high caseloads and low wages. But now they are armed with a report from the Sixth Amendment Center, commissioned by the state, which found Oregon's system is unconstitutional. Under the Sixth Amendment to the U.S. Constitution, anyone facing a possible jail sanction has the right to an attorney. When a defendant can't afford one, states are responsible for providing a publicly funded attorney. In Oregon, anyone changed with a misdemeanor or felony has a right to an attorney. In fiscal year 2018, public defenders tried 175,311 cases. Deitrick said exact figures aren't available, but that public defenders are used in 85 to 90 percent of all criminal cases in Oregon. But it's not clear how many attorneys the state uses. The state contracts with law offices, which then hire their own attorneys. Because they are all independent contractors, the state has very little data on how the system is actually working. Deitrick said he expects more attorneys would be used in the new model because the state would have the data to properly staff the caseload. But without that information, the agency doesn't yet know what proper staffing numbers are. Lane Borg, the agency's director, told Joint Ways and Means Subcommittee on Public Safety on Tuesday that the legislature repeated tries to fix the same broken car. The issues get worse and worse. Oregon's policy of paying lawyers a flat fee per case "pits appointed lawyers' financial self-interest against the due-process rights of their clients; and is prohibited by national public defense standards," Borg said. Jessica Kampfe, director of Marion County Public Defender, testified Wednesday that the only way for public defenders to make an adequate living is to take on a high caseload, making the current system unfair to lawyers and clients. The agency has been working with the chairs of the judiciary committees, Sen. Floyd Prozanski, D-Eugene, and Rep. Jennifer Williamson, D-Portland, to fix the issue. Williamson has introduced a proposal that would restructure public defense services so that 60 percent of the attorneys would be state employees and the rest would be contract workers. "We have to fix it," Williamson said in an interview, adding the current model is unconstitutional. That bill has a hearing in the House Judiciary Committee on Tuesday. The change would take four years to roll out, Deitrick said. His agency would work with the Department of Administrative Services to lease buildings in counties throughout the state, and would hire many of the lawyers who currently operate under contract. He said an exact budget is still being worked out, but a proposed figure will be presented Tuesday. In conjunction with the model overhaul, Deitrick said the state should look at trimming the criminal code, which has ballooned. When Borg was asked by Sen. James Manning, D-Eugene, if the code is too vast, Borg got quiet. He then said the system is like a "black hole." The state has expanded the list of crimes to solve more and more issues, only to find not every problem can be fixed by the criminal justice system, he said. Deitrick said some jurisdictions have started to decriminalize charges such as driving with a suspended license, but he isn't aware of a statewide push. In Oregon, Deschutes County District Attorney John Hummel recently told his county commission if it didn't increase his budget for more attorneys, he would stop prosecuting minor crimes so his resources can be focused on cases such as murder. "There are a whole bunch of cases in our criminal justice system that are just people who are using controlled substances either because of chemical dependency or whatnot, that I have no idea why lawyers are involved in solving their problems," Deitrick said. "I just don't." Eliminating criminal charges for some conduct is one way to manage caseloads. The other would be to hire more attorneys. Either way, Deitrick said, caseloads need to lighten. The current system has caused frequent turnover. The 70-attorney Metropolitan Public Defender office in Portland saw 35 attorneys leave in the past three years. In the past decade in Bend, the average length of stay for public defenders was 2.5 years. "These offices are imploding," Deitrick said. Right now, Oregon doesn't track how many cases public defenders take on in a year. But he said it's likely over the old national standards of 400 misdemeanors or 150 felonies. That metric has subsequently been tossed because it treats a murder the same as third-degree robbery. Deitrick said the plan is to move to a weighted system, where individual crimes are allotted a number of points. The state would come up with its own point threshold for a maximum caseload – something he said is imperative if we want justice. "When I was an attorney, there were cases I know I didn't spend enough time on. I think that's really hard for people to admit because they want to feel proud about their work," said Deitrick, who was a public defender for 10 years. "Amongst themselves they all share it. They are comfortable talking to themselves about it, but when it comes to talking to people outside of the public defense community, it's a touchy subject. But they all know it." According to the Sixth Amendment Center report, a Multnomah County public defender was representing a total number of clients that under the old guidelines would require four attorneys. On Wednesday, Marion County public defender Andy Acosta testified that he often has to make the choice between spending time with his family on nights and weekends or working. It's a tough choice, and if someone chooses family, it can lead to an innocent person going to jail, he said. Williamson was adamant that the state has no choice but to go along with the Public Defender Services proposal. Not doing so puts the state in jeopardy of being sued for violating civil rights by not providing proper representation, she said. But she acknowledged legislators who haven't been working on the issue would likely be caught off guard by a proposal to overhaul a state agency midway through the legislative session. "It fundamentally is an unethical position to put a criminal defense lawyer in – being self-motivated against providing the most zealous defense of their client, which is the constitutional requirement," Williamson said. "It is a liability to the state – it's only a matter of time. They have to change their funding model."